← Are Tree Removal Services Something You Need? At the mention of “theme gardens”, you probably wouldn’t know exactly how to describe it, but you sure would recognize it when you see one. You would be able to tell that one is a Japanese garden, for example, or if it is an herb garden, a garden of roses, or even a rock garden. Some may simply showcase its theme by having shades of a particular color be the dominant feature, others are more intricate and defined, such as making a maze, a garden with plenty of fountains and waterworks, or one that features a little village using garden gnomes and tiny ceramic houses. With this, we can establish a more concrete definition of theme gardens: any garden or landscaped yard that is organized and arranged around a unifying idea or design is a theme garden. When it comes to themes, there is a seemingly infinite range of choices and ideas—it all depends on how you let your imagination run its course. A theme can centralize around a color, a particular plant or a type of plant, an era or period, a country, or even a fictitious setting. A theme, then, acts as a set of rules; however, despite this, it still provides you with the freedom to let your creativity and imagination flow. For others, choosing a theme may be the most difficult part, but actually, you don’t have to think too hard about it—all you have to do is to know what you’ve got by observing your area, recognizing your interests, and of course, checking your resources, and the availability of materials you need for your garden. If you’re keen on having a theme garden but do not have a theme in mind yet, it works to take a tour of your space and see what you already have. Sometimes non-theme gardens even already offer an incipient theme—like an idea just lurking behind the bushes, literally speaking. The next step would then be to stop for a moment and review your interests; is there a color, country, setting, or period you particularly like? Lastly, consider your budget and resources, as well as the availability of the plants and materials you will be needing for your garden. Once you have gotten these in check, you can then begin to visualize and plan the structure and arrangement of your theme garden. After which, you would need landscaping with the help from providers of tree removal service, which is needed should your theme garden require a wide and open clearing. AJ Tree Service is your go-to partner when it comes to tree removal and landscaping in Broken Arrow, Oklahoma. 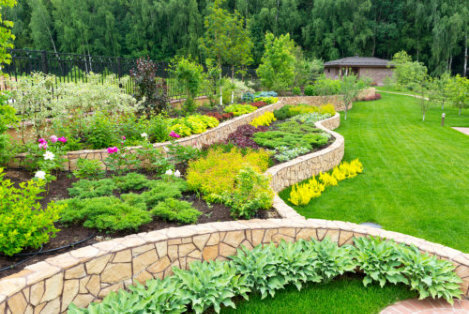 We provide a wide array of services that can help you create the garden of your dreams. With us, you can rest easy knowing that the hardest part of bringing your theme garden to life is handled by professionals. Contact us today for an efficient, fast, and reliable tree service in Tulsa, Oklahoma, at 918-232-4853. This entry was posted in Theme Gardens and tagged idea on gardens, landscaped yard, Landscaping, review your interests. Bookmark the permalink.